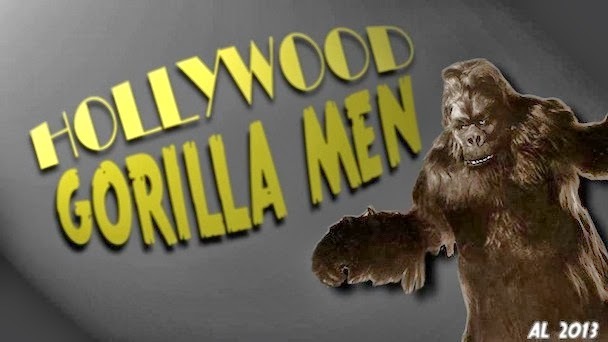 Hollywood Gorilla Men: Beware of Horny Space Gorillas ! Beware of Horny Space Gorillas ! Returning to our series on gorilla men in space,we come to a gruesome duo of similar species yet separated by two decades . The dreaded Horny Gorilla ! 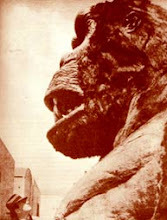 Notable is the fact that in this case, both alien monsters are in fact gorillas. 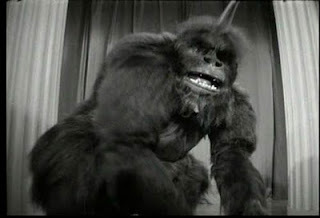 The alien gorillas in this case ,separate themselves from their Earthly counterparts with the addition of a large single horn atop their furry noggins. First up is the Orangapoid, as played by Ray Corrigan,in the Buster Crabbe staring Flash Gordon movie serials. The fearsome creature was the slave of Ming the Merciless ( Charles Middleton) and was used to dispatch Mings foes in an arena. Flash,eventually gets the upper hand and harpoons the vile beast with a spear supplied by Mings daughter, Princess Aura. FLASH forward (he he) 20 years and we find ourselves in another intense struggle, this time with the heroic Captain James T. Kirk locked in deadly combat with the dreaded Mugato, (AKA Mugatu, and Gumato according to the end credits ), in the Star Trek episode "A Private Little War"
Unlike the Orangapoid, the Mugato is albino, and has an additional row of horn like spines running down his back. 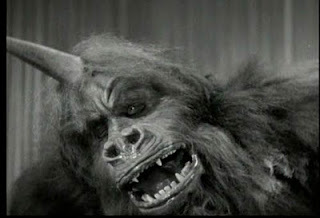 To add yet another frightening aspect, the bite of the mugato is venomous, and Kirk will assuredly die if not treated by the local kahn-ut-tu woman, a gypsy like healer of unearthly beauty. 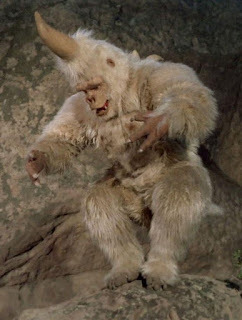 Kirks survives to engage the Mugato once more before the episode is over. 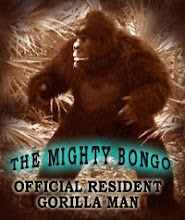 The Mugato was played by versatile gorilla and monster performer, Janos Prohaska. Prohaska, a stunt man and athlete had amazing agility to move with great intensity in all the various creatures he portrayed. 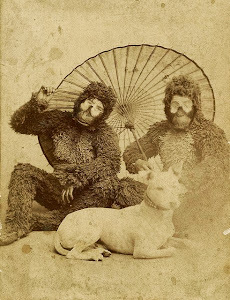 He was one of the few gorilla performers I've seen who could climb a tree with little to no effort while fully decked out in one of his massively padded gorilla suits. As such Janos made a supremely formidable foe for the good Captain Kirk. Both these programs wisely used Gorilla men for cost cutting efficiency. People who pooh pooh these scenes are really short sighted. It really is no different than putting a prosthetic on a human actor and calling him an alien. Ageed, when you take into context the huge variety of both human and humanoid life forms out there, it only stands to reason that other Earth like species would also be present. I'll take a good monster suit any day of the week over a guy with a rubber forehead glued on. Terror at the Circus !